Located in the peaceful residential district of Hietzing, Hotel Cortina is only a 5-minute walk from the Ober Sankt Veit Underground Station. Free WiFi is provided and free public parking is available nearby. 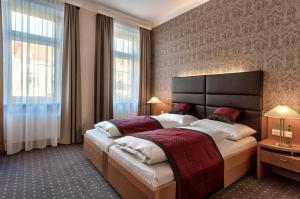 The Cortina Hotel’s quiet and modern rooms offer cable TV, a minibar, a safe, and a bathroom with hairdryer. In the morning, guests can enjoy a rich breakfast buffet. A wide range of drinks and snacks is available at the Cortina’s bar. Tickets for opera and theatre performances, as well as for public transport, are available at the reception of the Cortina. Schönbrunn Palace can be reached by underground (line U4) in 6 minutes, and Vienna’s city centre in 15 minutes.